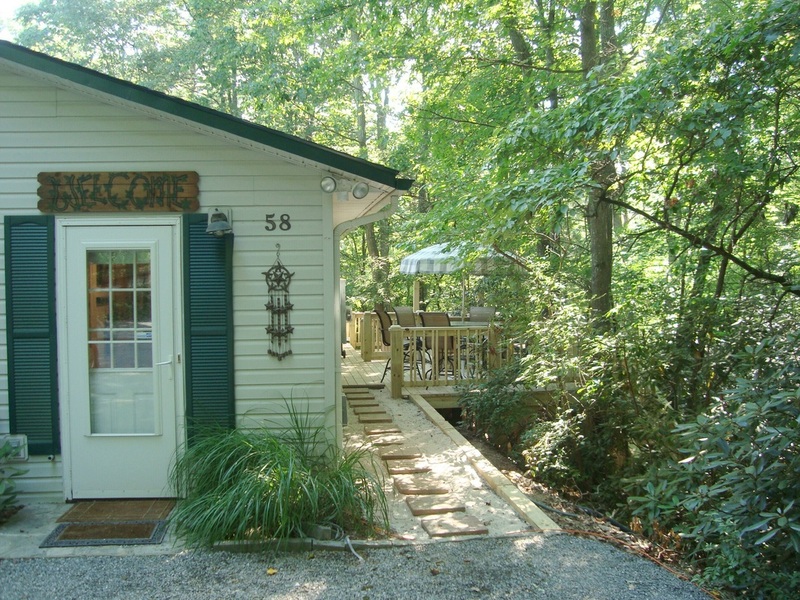 Nestled beside a Rhododendron forest, the TWIN CREEK COTTAGE offers a sweet cottage with modern sophisticated style and comfort. 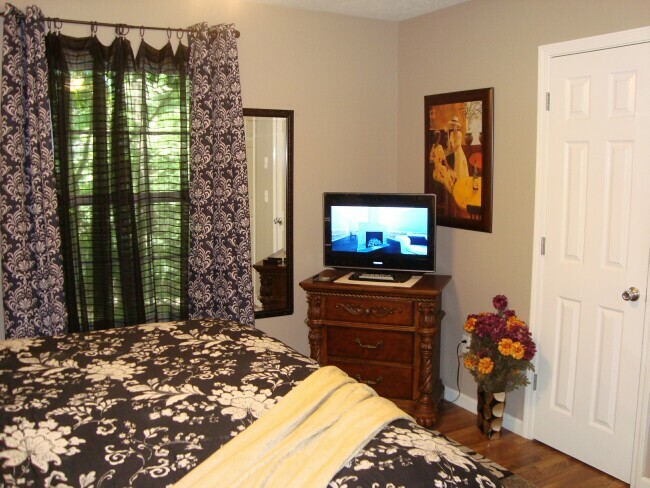 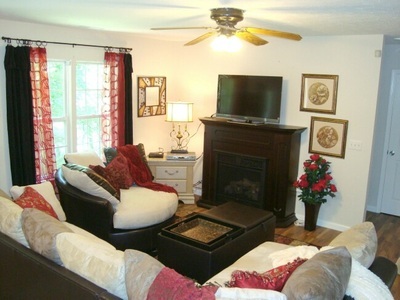 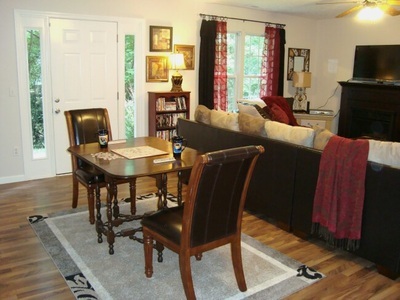 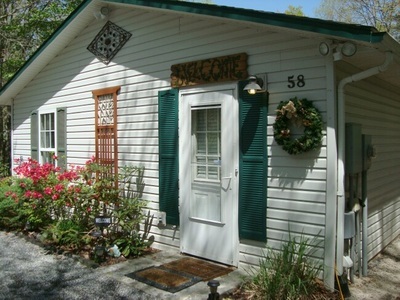 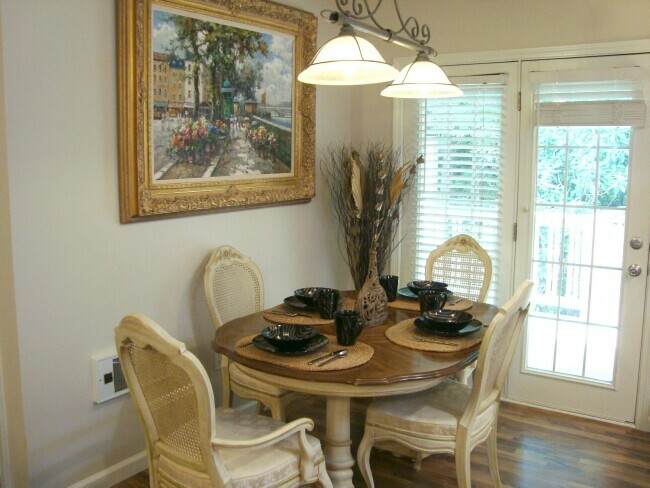 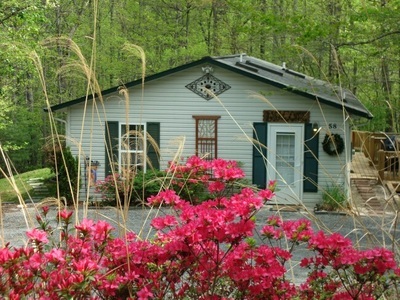 This charming one level 3 bedroom, 2 bath cottage vacation rental is located right in town! This delightfully decorated home has a spacious open concept kitchen/dining room/living room with plenty of natural light. 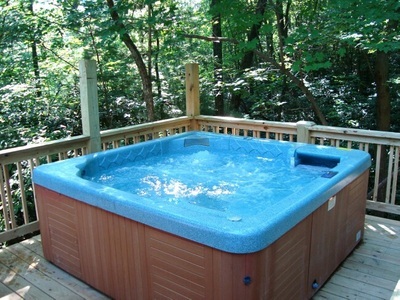 Be outrageously pampered with the awesome massage chair, huge hot tub for 6, designer furnishings, top quality plush king, queen and twin bed mattresses, gas log fireplace, high speed wireless Internet, 4 HDTVs 3 with built-in DVDs, big DVD movie library, PlayStation 2 with games, quality cookware & dishes, fire pit for marshmallow roasts, outdoor playground with fort, slide, swings & climbing wall, baby accessories including a full size crib, outdoor dining deck under the trees. 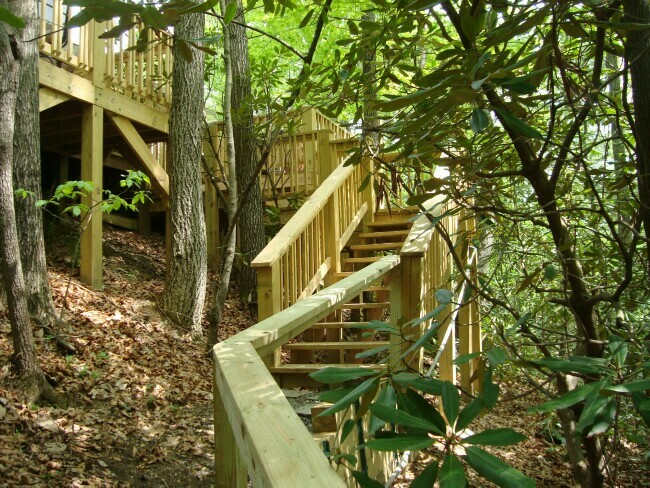 Follow the enchanting stairway down to the canyon bench and tiny stream. 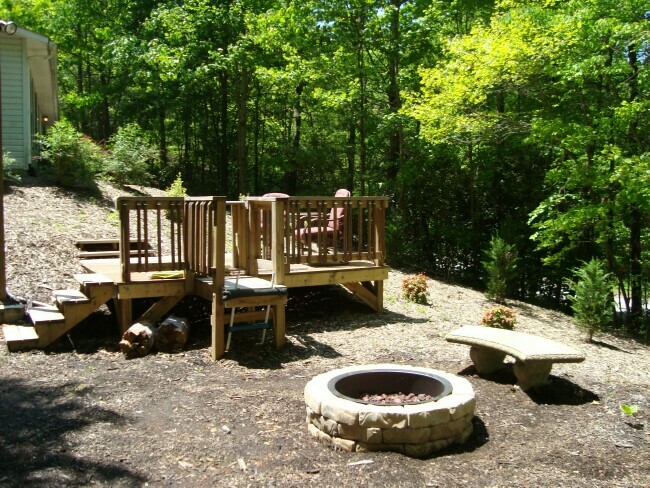 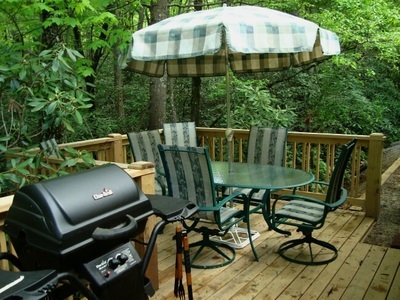 LOCATION: Twin Creek Cottage is conveniently located just 3 miles south of Interstate 26 (Exit 44) with only 15 minutes north to Asheville, 20 minutes to the Biltmore House and 5 minutes south to downtown historic Hendersonville Main Street shops and restaurants. Although in a private, tranquil setting, the convenient in-town location allows easy access to all the area’s activities, restaurants and shopping. 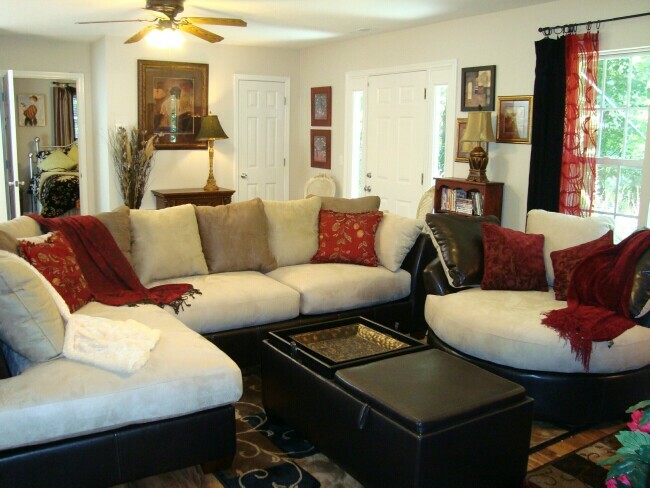 OPEN CONCEPT LIVING & DINING ROOMS: A comfortable, chic sectional lounge, sofa and half circle swivel chair add a sophisticated touch to this designer room complete with an elegant gas log fireplace, wood floors and an HDTV with built-in Blu-ray DVD and large DVD movie library. 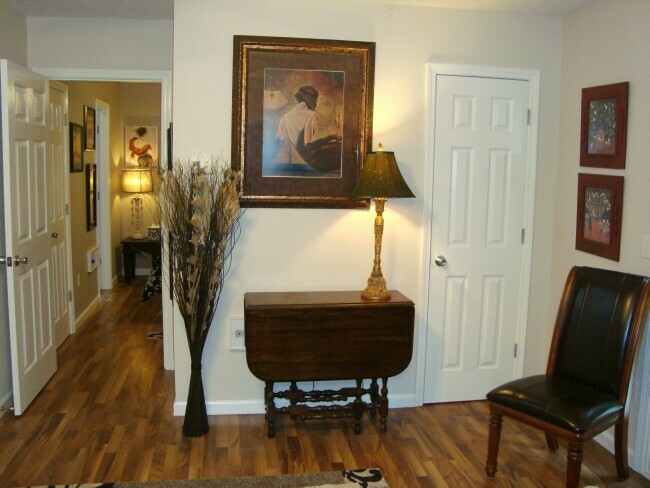 There is plenty of room to stretch out whether to relax, watch TV or visit with friends and family. Sooth your muscles after a day’s activities in the awesome i-Joy massage chair. 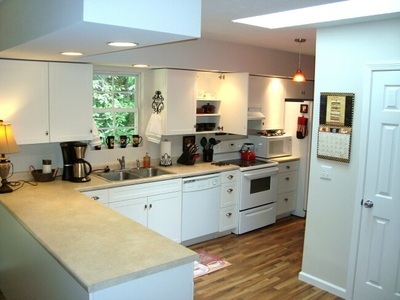 KITCHEN: This spacious kitchen with skylight has ample cabinets, counters, new appliances, a large pantry and plenty of natural light from the large skylight above. 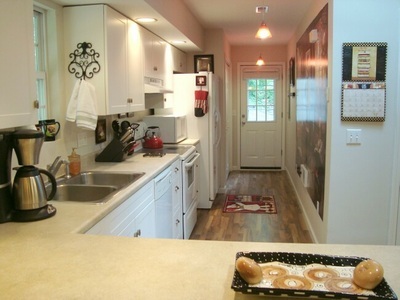 Appliances include refrigerator with ice & water in door, ceramic cook top oven, dishwasher and microwave. It is fully-equipped with plenty of quality cooking equipment and kitchen accessories to please any chef (see the listing of kitchen amenities below). 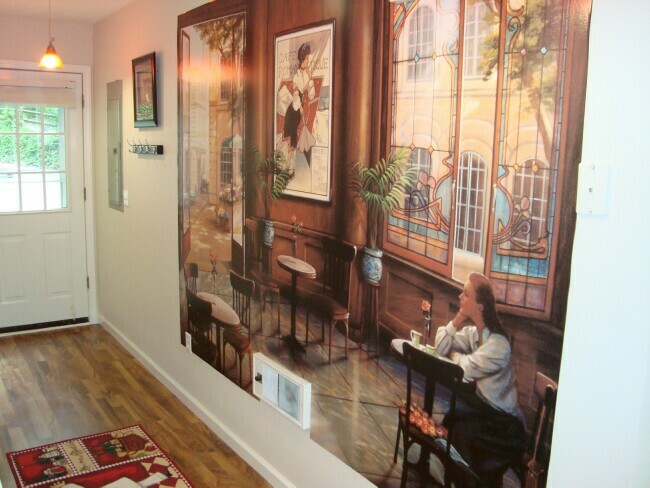 A delightful 8 foot wall mural “Café Romanique” depicting a quiet restaurant scene adds a dramatic dimension to the room. 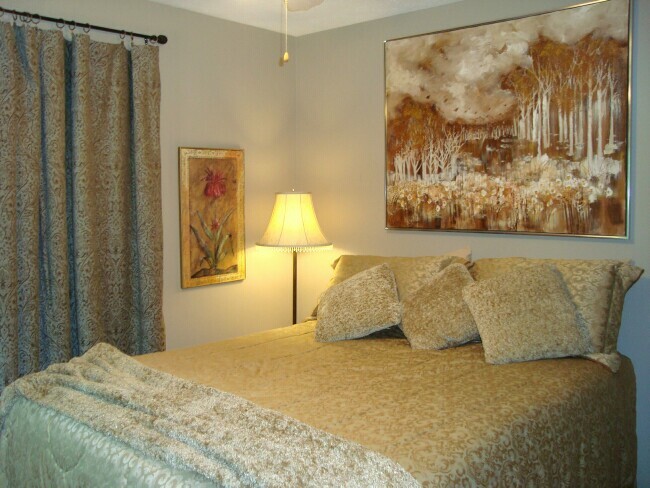 The master bedroom has a high quality plush king bed mattress with stylish comforter and sumptuous linens, HDTV with built-in DVD, 2 closets and delightful artwork. 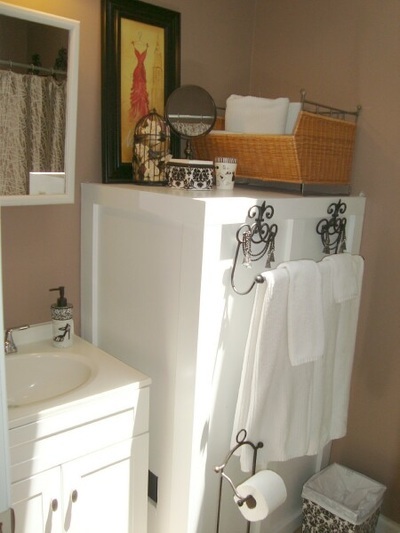 You also have your own private bathroom with a skylight for natural light and a combination tub/shower and soft plush towels. 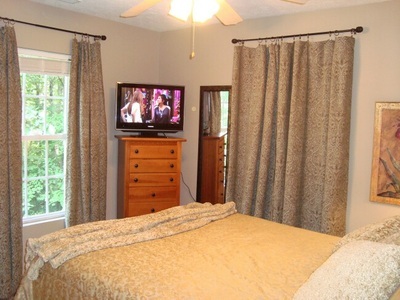 QUEEN BEDROOM: This guest bedroom has a wonderfully plush queen bed mattress with sumptuous bedding, HDTV with built-in DVD, charming wall art and a woodlands window view. 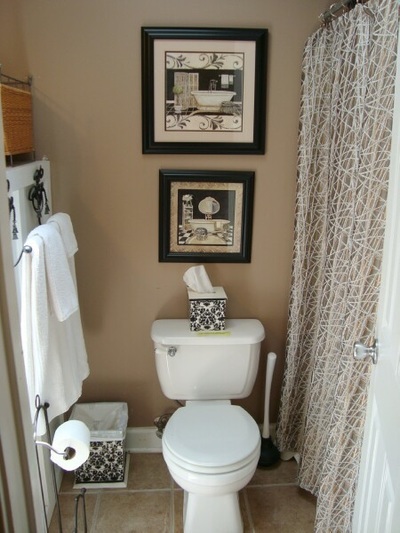 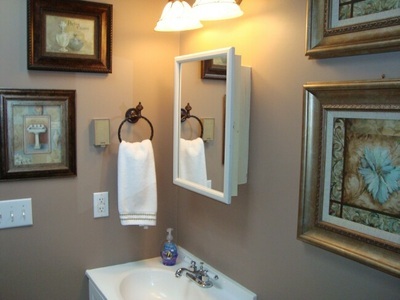 Across the hall is a very pretty full size bathroom with a skylight, artwork and a combination bath & shower. 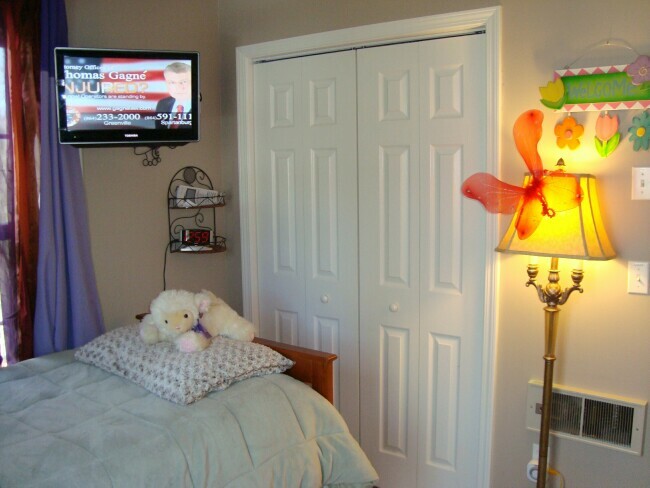 CHILDREN'S BEDROOM: A third bedroom has been set up for kids with a cheerful “Alice In Wonderland” mural, stuffed animals and toys and a HDTV. 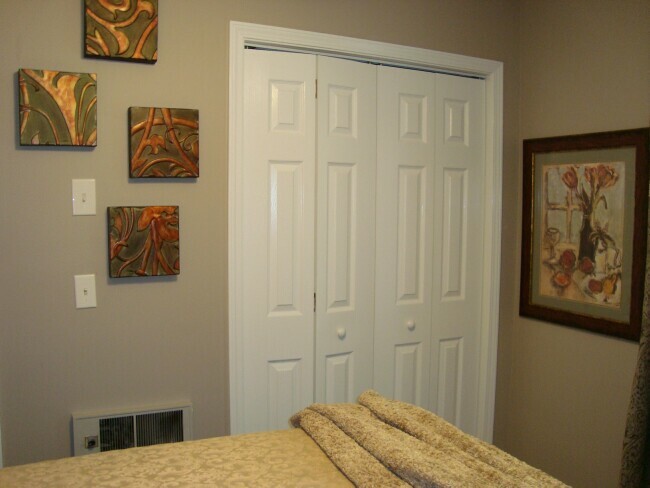 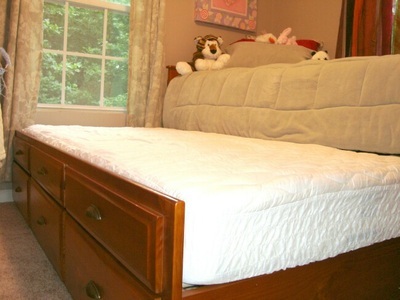 There is a super comfortable twin bed with a pull-out twin trundle as well as a full size baby crib. 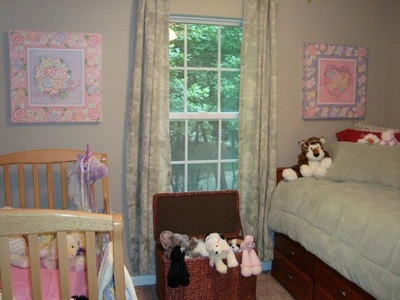 For babies you will find a high chair, stroller, baby bath tub & pack-n-play. For additional guests, there is a twin air bed with built-in quick inflate-deflate motor. 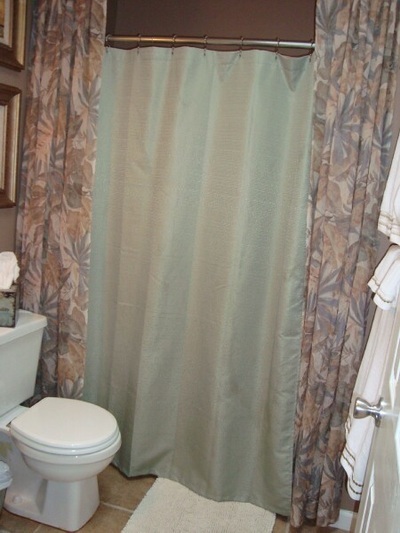 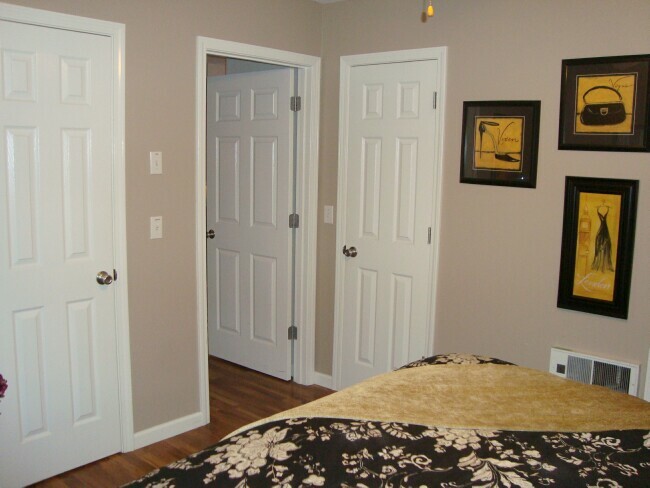 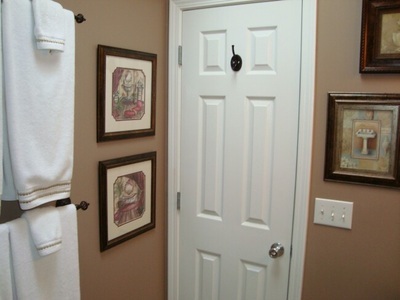 Just outside the two guest bedrooms is a second bathroom with skylight and a combination tub/shower and plush towels. OUTSIDE: Just outside the dining room glass doors are two spacious decks under the trees….one for the large 6 person deluxe hot tub and the other for the patio table and chairs and gas grill. There’s even a surprise stairway winding down to the lush forest canyon where you can enjoy the tiny creek. 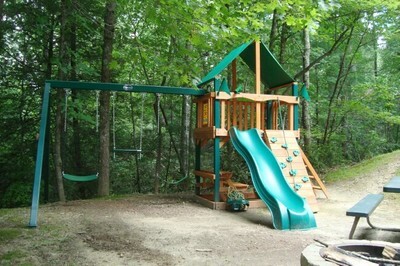 Kids will love the home’s back yard where there is a playground complete with fort, slide, climbing wall and swings including a baby swing. 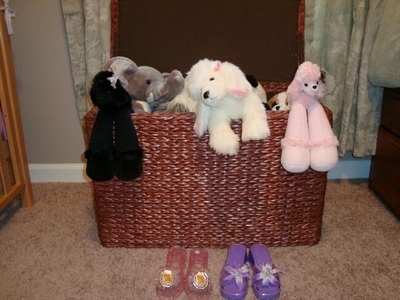 FOR CHILDREN & BABIES: Always important guests at our homes, we provide plenty to keep children entertained and enough baby equipment so parents can travel lightly. For babies there is a crib with bedding, pack-n-play, high chair, stroller, baby bath tub, cuddly stuffed animals and soft blankies. 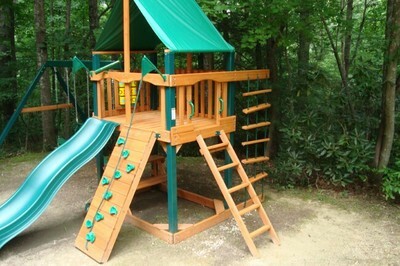 For kids there is a big outdoor playground with fort, slide, climbing wall and swings as well as a PlayStation 2 with a dozen games. 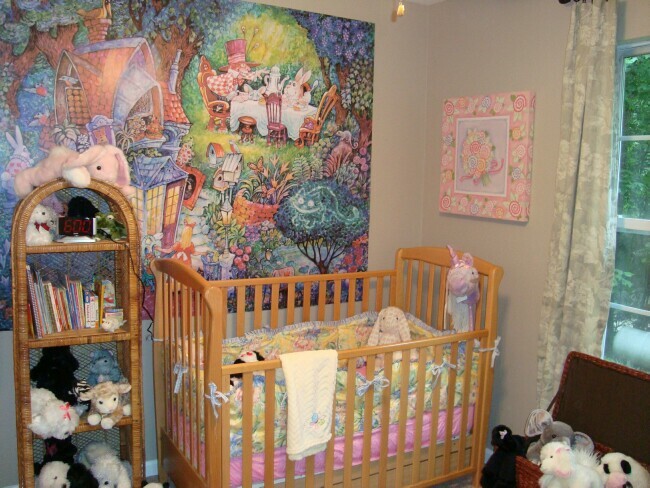 Kids love their bedroom with an “Alice in Wonderland” mural filled with stuffed animals, books, games and toys. 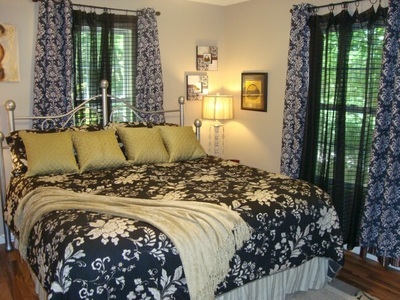 YOU ARE INVITED TO BE SPOILED!!! 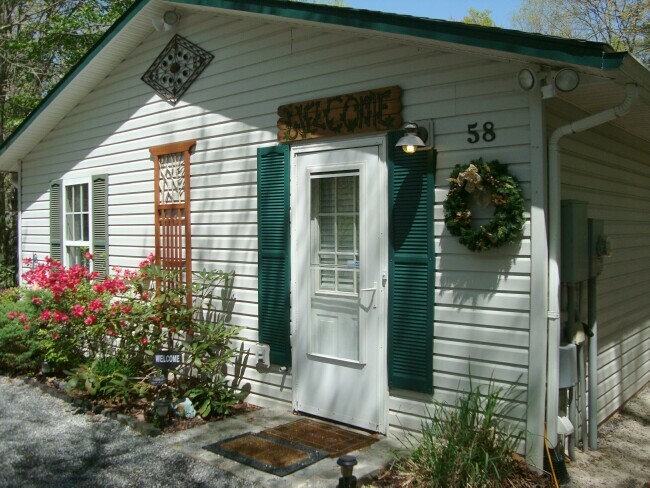 With all the special touches, Twin Creek Cottage is a warm inviting home rather than a "vacation rental house." 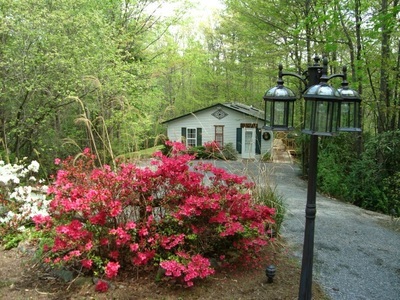 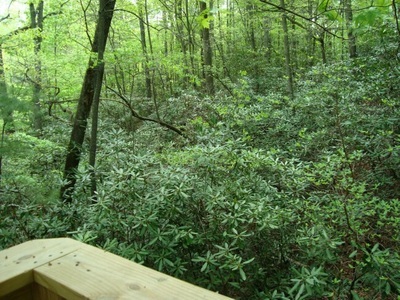 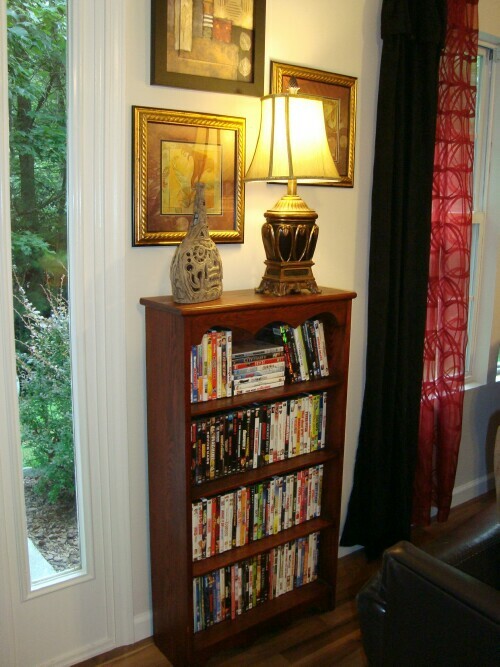 I am a local Asheville, NC owner who takes exquisite care of my home and am available anytime to see to your needs. 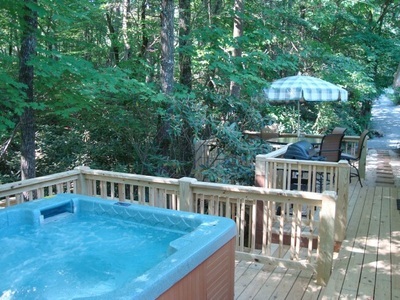 I make sure each home is exceptionally clean, meticulously well-maintained and the hot tub sparkling with fresh water. 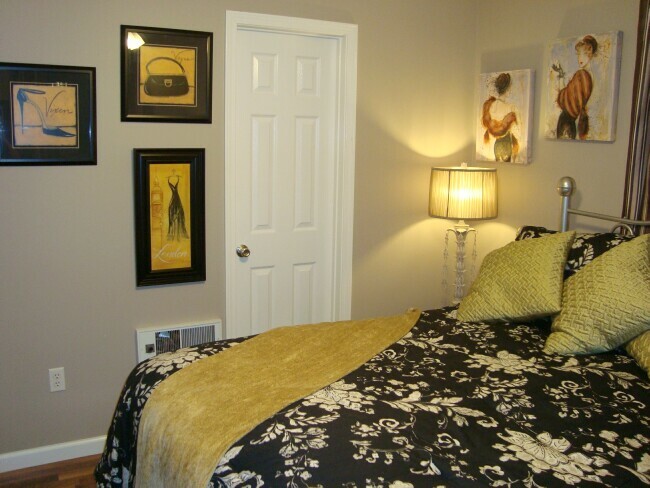 With the thoughtful little extras provided, you will feel that you’re staying at a best friend’s home. YOU are my full time business!